In stillness we find our might. In darkness we find our Light. Turn the senses inward for your insight. Your Truth awaits you. Yoga is not a religion. Yoga is the science of the mind, encompassing an eight-fold path towards a union (Hatha) of the Self and the Divine (Samadhi). It is a science designed to help us manage the active mind, and develop positive personal aptitudes in our observances of the Self (Yamas & Niyamas). Yoga not only encompasses Postures (Asanas), Breath Control (Pranayama), and Concentration (Dharana), but also Sensory Withdrawal (Pratyahara), and Meditation (Dhyana). In truth, Yoga itself is not a once a week exercise class. Instead, Yoga is a lifestyle and a way of Being. Using The Yoga Sutras of Patanjali to detail the science of Yoga, we explore the obstacles of the mind that exist, and the causes of human suffering. At Shiva Gian Yoga, the focus is on all eight aspects of Yoga, offering an experience of Yoga that can help you with your own Yoga Practice outside of the Studio, in your everyday life, and in your every breath. 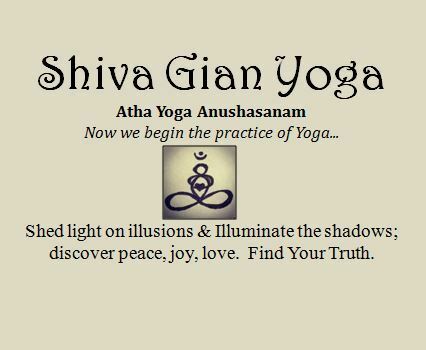 Please join Shiva Gian for your next Yoga Practice. Copyright © 2018 Shiva Gian Yoga. All Rights Reserved.